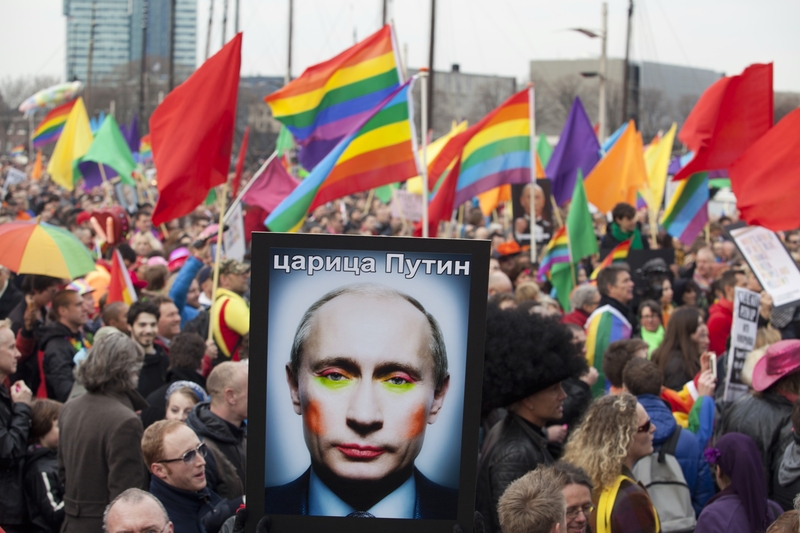 Will Russia's Anti-Gay Warmongering Actually Help It Win Eurovision? Will Russia’s Anti-Gay Warmongering Actually Help It Win Eurovision? This last weekend, Moscow police detained 17 flash mob participants from releasing rainbow-colored balloons in a town square in commemoration of the International Day Against Homophobia, Transphobia and Biphobia. Ever since passing that odious “anti-gay propaganda” law, Russian homophobes have made crashing LGBT gatherings a national pastime whether than means interrupting balloon releases, disrupting LGBT films, or beating up St. Patrick’s Day revelers after mistaking them for pro-LGBT demonstrators. The ongoing harassment of Russia’s LGBT citizens, combined with Russia’s ongoing aggression in eastern Ukraine is particularly interesting given Russia’s participation in the Eurovision international song competition. When Russia’s performer Polina Gagarina recently sang her song “A Million Voices”, some attendees waved rainbow flags, presumably in defiance of her country’s anti-LGBT stance. Gagarina herself supports LGBT rights, but Russia has not recently been popular with Eurovision fans. In 2014, the Russian Eurovision performer The Tolmachevy Twins got rounded booed by audience members when they took the stage, so much that Eurovision prepared “sound reducers” to drown out any booing that Russia might have gotten this year. If the booing got loud enough, one Eurovision organizer said, they would broadcast generic audience noise to home viewers instead. And yet, Russia is favored to place second in the international singing competition, according to Eurovision World. More interestingly, a poll of gay Eurovision fans taken by the gay men’s social app, Hornet, listed Russia as winning first place. Granted, Eurovision call-in voting prohibits votes cast in support of a caller’s home country, but considering that Eurovision’s most prolific winner, Ireland, has also had the largest percentage of LGBT Eurovision viewers, it certainly raises an eyebrow. Nevertheless, one Russian Eurovision attendee told Unicorn Booty that he plans on waving a Swedish flag in the audience. “People really don’t like Russia right now,” he said. We understand. In 2003, when George W. Bush invaded Iraq, many Americans decided to travel disguised as Canadians rather than get an earful or ire from peace-loving travelers abroad.